For decades I thought I wanted a Professional Mk. IV. Earlier this year I held a Mk. 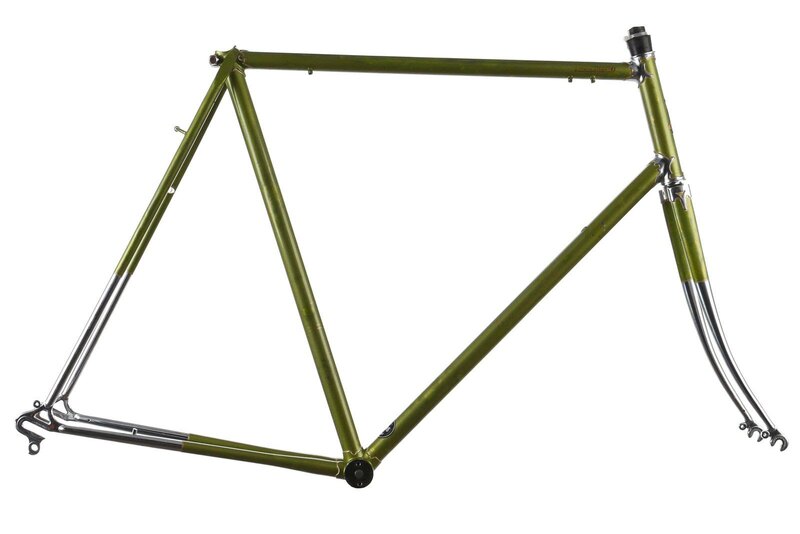 IV frame in my hands and realized it would be similar to my Mercian Pro, which I love dearly. When I got it back in '88 I was actually thinking of something more like the International - more relaxed and versatile. Well, it's about time. As far as I can tell this frame is in the '70-72 range. Does anyone have any hints that would narrow the year down? The seller didn't know. For starters I intend to hang my Campy NR components on it. I have NOS Shimano 600 high-flange hubs and Mavic Module 3 rims on hand which will look pretty close to original. I don't have any long reach brakes or handlebars, so I will need to source those. That and a few other bits and bobs will get me started, but I suspect in the long run this will be my daily rider around town so I may end up going townie with moustache bars, different gearing and wider tires. If y'all have suggestions, throw 'em my way! Last edited by ascherer; 10-16-16 at 02:02 PM. The Internationals are nice bikes... I've got a '74 and formerly owned a '71. Even Peter Weigle has a fondness for them, so that's a pretty good endorsement! No worries, always standing by. AND keep the Pro in the queue! Changed hosts. Did that work? BAZINGAAA! Very cool, looks like the original paint should be usable for an excellent specimen, and while I agree with your year assessment, I expect the true experts will be along shortly to correct us if we are wrong. Thanks to [MENTION=152773]I suspect in the long run this will be my daily rider around town so I may end up going townie with moustache bars, different gearing and wider tires. If y'all have suggestions, throw 'em my way! We rcvd that color for sale in the USA in '71 if memory serves, the serial # guide should get you the year of production. Enjoy, mine's been in continuous service for 42 years so far. 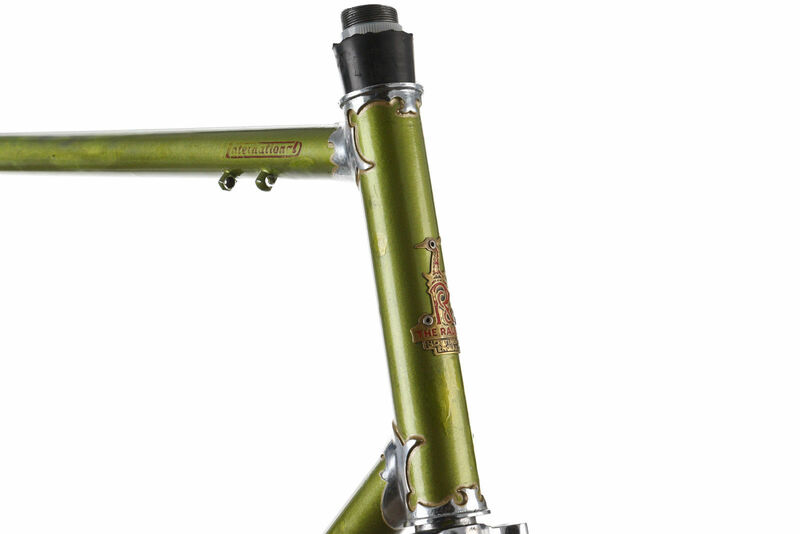 The top tube decal should be ~'71 I think. Got a pic of the headbadge? Looks like the usual Heron and not the anniversary badge. Looks like it has rapid taper chainstays(?). Last edited by Sir_Name; 10-16-16 at 02:29 PM. Spot on, @Bandera. What is that crankset? Sugino BMX (really) 44T 1/8" pitch chainring to mate w/ the 3cog Cyclo conversion on the '56 AW hub. "Let's see, is that one click Up on the IGH and a shift Down of the cogs or the Oher way around?" One thing that can be said about the Carlton designs is that were Versatile, this frameset has been raced on the road and in 'Cross, loaded for touring and now serves as a Town Bike. Last edited by Bandera; 10-17-16 at 06:50 AM. Welcome to the International Club! I LOVE my '71, and I also love the electric green paint that came on those frames. Killer! @Bandera, I know about those Cyclo conversions. My mentor, the fellow that gave me his '71 PX-10 fitted a Rudge with one of those when he was stationed in Germany between WWII and Korea. He rode that to avoid "paying the ex-Nazi Messerschmidt pilot turned taxi driver" what amounted to about ten times the bus fare to get back to the base from town when he was on leave. Problem was the bus stopped running long before the bar closed! To this day he dreams of rigging up a SA 5-speed with a 6-cog conversion and a triple in the front. [MENTION=335281]To this day he dreams of rigging up a SA 5-speed with a 6-cog conversion and a triple in the front. I agree that it's likely a '71. The '70 had the anniversary head badge and the '72 had block Raleigh lettering on the downtube rather than cursive (I think). But as others said, the serial # will confirm. A '71 should start with an F.
My '71 Int'l is currently in a secret bunker in Portland, OR, undergoing a transformation. I'm learning! The Headbadge site led me to think that the serial numbers weren't reliable. The photos I have don't show the full serial, so I won't know 'till it arrives. Anticipation... In the meanwhile I'm going to search for my cable guide. Hm, curious to see what's cookin'. That orange international is very pretty. On a side note...I've got an old beat up Motobecane I''m repainting and figuring out what to do with...anyone have experience with an IGH and a front deralliur? I can't recall having seen it done anywhere and I'm wondering if there is a good reason why not. Looks like 1971 to me. I expect chain wrap is the issue. You'd need a tensioner to take up the extra chain on the smaller chainwheel. Maybe such a thing exists? Ah good call; I feel a bit silly. You'd have to use a rear deralliur justto twndion the chain to use a front deralliur. On the other hand...you would still have an undished stronger wheel. The frame arrived today and it looks really good. No dents or rust, the chrome is excellent and I don't see any rust. Inside of the seat tube and BB shell look clean. It's been touched up (a lot) over time using a pretty good match. The only decals remaining are "Raleigh" script on the down tube and "International" in red italic on the top tube, one side better than the other. Quick string and eyeball measure suggests the stays are even, and so far the threading seems good. The serial is F8036 which matches the decals as a '71. Now the fun starts! Gotta get me some Frame Saver...and a bunch of bits and bobs I either don't have any more or can't find. And I get to build new wheels! Yippee!! No need to use a derailleur. There are plenty of chain tensioners on the market. In fact there is even a Shimano Alfine version.